The Balloon Inflation and Launch Shelter (BILS) is a low cost, semi-automatic system providing a shelter for preparation and launching of radiosondes and sounding balloons for upper air observations. It is compatible with a variety of commercial radiosondes. The BILS is ideal for either ground or roof mounting. The Balloon Inflation and Launch Shelter (BILS) is a low cost system providing a shelter for preparation and launching of radiosondes and sounding balloons for upper air observations. It is compatible with most commercial radiosondes. The BILS is ideal for either ground or roof mounting. Best design practices are used throughout the BILS so it will provide years of trouble free operation. Ground mounted BILS systems are typically set on concrete slabs and secured to J-bolts. It can also be mounted on rooftops having suitable concrete or steel structures. The BILS enclosure is made from seam welded aluminum plate, with an RF-transparent upper Plexiglass portion to permit GPS radiosondes to lock onto satellites prior to release. If the air foil option is installed, the overall width increases to 12′W). When the BILS door hatch is open, the overall length is 20′. However, with the door closed the building dimensions are 14′L x 8′W x 11′H (height to top of door), plus two feet on either end for the steel frame. Four eye hooks are provided on skid corners to permit crane lifting. BILS-9004 Balloon Inflation and Launch Shelter (shown without optional air foils). A steel base plate frame extends beyond the 14′L aluminum BILS inflation chamber, providing ample space for user-supplied helium gas tanks. In addition to providing tank storage, it adds mechanical rigidity to the system and permits flexible roof attachment. A fork lift can move the unit if necessary. At sites where the tank farm must be remote located for logistics, gas can be piped in. An adjustable helium gas regulator and solenoids control gas flow and a user-provided meter can log gas use. The balloon inflation chamber is 8′ in diameter and 11′ high, and supports launching up to 800 gm balloons. The inside of this area is covered with a soft polyethylene sheathing curtain that protects the balloon from contact with sharp objects inside the inflation chamber. During inflation, a rubber gas line holds the balloon centered to eliminate contact between the balloon and the inflation chamber sheathing or the hatch roof. An adjacent 8′W x 7′H x 5W L storage compartment with 36″ workbench provides an area for operators to keep out of inclement weather during balloon and radiosonde supply. A locker is provided for expendable and small tool storage. A door separates the inflation area from the storage compartment, and non-skid floors have drainage holes. Inside the storage compartment is a combination system control and inflation panel, with an embedded processor. The system controller monitors various parameters such as air temperature and switches. It activates the roof hatch motor, cutter servos and gas solenoids for balloon and roof control. Operators can prepare the radiosonde and sounding balloon train in the BILS storage compartment and then inflate, open the roof hatch and release the balloon either from within the storage compartment (locally) or remotely controlled via the RS-232 system interface. Each BILS system includes ALEX, a MS-Windows application that monitors system activity. It can be installed on a local or remote user-supplied PC that is connected to the system via RS-232. For example, this application can be run on a nearby forecast office PC providing critical balloon release timing window information. The CPU monitors the status of the following switches: ventilation blower, roof open limit and open over travel, roof closed and closed over limit, balloon launch, gas and hatch locked. All wiring meets national electrical code requirements. If the Heater option is provided for use in colder climates, an exterior weatherproof circuit breaker/junction box is provided for 208/240 Vac connection to customer AC mains. Otherwise the system plugs into a standard 110V outlet. The roof hatch is locked in the open position by a safety locking solenoid. Door hatch travel and position detection is made via a precision analog position sensor and motor speed is slowed nearing the end travel. If the system detects over travel it requires a manual reset. Balloon neck release is controlled by a servo linked to the system embedded controller via a fiber optic link. An emergency manual local manual safety override is provided. In addition to RS-232 remote control, local balloon release and roof pushbutton controls are mounted on the control panel inside the storage compartment. The RS-232 interface provides system status in near real time including current roof position, inside and outside temperature, and critical fault conditions such as roof actuator failure. 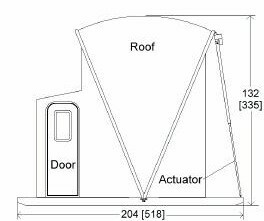 The roof hatch is curved to shed snow and is controlled by a widely available COTS weatherproof electromechanical ball screw capable of more than a 2000 lb. load. This reliable internal ball screw roof motor drive provides an added level of safety as the system controller monitors motor current to detect a jam conditions and halts roof motion. Although the roof cannot be moved without removing the ball screw drive, a separate solenoid latches the roof in the open position to permit safe maintenance. Four internal blower fans aspirates outdoor air through nonconductive ducting. Inflation chamber and outdoor air temperature is monitored. An outside 70 watt high pressure sodium lamp provides general area illumination near the door area and is under photocell control. Inside the storage compartment and the inflation chamber are sealed, low temperature rated, weatherproof florescent lamps for area lighting. For convenience, 110Vac 15A electrical outlets are provided in the inflation chamber, storage compartment and outside. The BILS was initially developed by the National Center for Atmospheric Research and several systems were delivered to NWS research offices in the mid 1990s. Its goal is to semi-automate labor intensive human-operated soundings. In 1998, YES received a Phase II SBIR award from the United States Department of Energy to develop a fully-automated radiosonde launcher for 600 gm balloons (Models ARL-9000/MERV-9200.) In 2003, YES received a SBIR award from NOAA to develop a semi automated, single radiosonde launch system. YES engineers worked to adapt the original NCAR BILS to address weatherability and provide compatibility with NWS′ evolving Radiosonde Replacement System and new GPS radiosonde technology. Width increases to 12.5′ when air foil option is installed. All-metal construction provides lighting protection via chassis. ≤ 45 mph operational, 120 MPH storage with suitable tiedowns 30 lbs./sq. ft static roof snow load. 40 lbs./sq. ft floor loads. BILS shown with the roof closed (left) and roof open (right). Airfoil and HVAC options not shown.